This ATV ride in Pattaya takes you speeding across tricky obstacles on a quad bike for an exciting adventure in Pattaya. As you arrive at the activity site, you'll begin with a quick training session with an experienced adventure guide who will teach you the controls and riding techniques of the quad bike. When you're ready, you'll drop into a purpose built course with several different challenges for a 10-minute ATV ride. Open up the throttle, navigate the obstacles for a thrilling time on the course. The activity site at Pattaya is located on the Threppassit Road, near the Sanook Park. 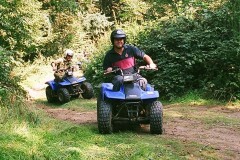 The activity site hosts a custom-built course where you can drive the quad bike. Maintained by a crew of experienced adventure guides, the ATV ride is entirely safe and certified. Apart from the quad-bike ATV ride, you can also try your hand at several other adventures on offer at the jump site like the human slingshot or bungee jumping. • Go on a quad-bike ATV ride in Pattaya. • Get the ATV ride experience with the highest standards of safety. • Learn to ride the quad-bike before the ATV ride. • Have a thrilling adventure with your family or friends. Travellers are required to weigh a maximum of 100 kgs in order to book this ATV ride in Pattaya. Travellers are required to follow instructions of the adventure guide during the ATV ride in Pattaya. For cancellations made 7 days or more before the scheduled Pattaya ATV ride: 100% refund. For cancellations made between 3-6 days before the scheduled Pattaya ATV ride: 50% refund. For cancellations made less than 3 days before the scheduled Pattaya ATV ride: no refund. All refunds will be processed after deducting international payment transfer fees. Please check with us what these charges will be for this Pattaya ATV ride. Pick-up and drop-off from your hotel to the activity site can be arranged at an additional cost of 500 baht, only if your hotel is located in Pattaya or Jomtien. If you prefer to travel to the activity site by yourself, please arrange to arrive at the activity site between 09:00-18:00 hrs. The tour operator takes utmost care to ensure safety of the travellers and shall not be held responsible for any mishap, accident or loss of life during the ATV ride in Pattaya. There is no pick-up for this Pattaya ATV ride. There is no drop-off for this Pattaya ATV ride. Go on an ATV ride in Pattaya! Arrive at the activity site at any time between 09:00-18:00 hrs. Once you arrive at the activity site, you'll have a quick training session with an adventure guide on how to operate and run the quad bike used for the ATV ride. Once you are ready to drive, you'll take the quad bike and open the throttle up on a purpose built course with tricky obstacles. After your 10-minute ATV ride, you can relax at the activity site. Your trip ends here. Take a 10-min ATV ride on a purpose built course! All equipment required for the ATV ride: quad bike, helmet etc. All equipment required for the ATV ride: quad bikes, helmet etc. The activity site is located on the Threppassit Road, located 10-min drive from Pattaya. The city of Pattaya is well-connected to most major cities of the world via flights to Pattaya's U-Tapao International Airport. You may board a flight to the airport and travel to the activity site, located 1-hr drive from the airport, via hired private cab/taxi.